I'm always looking for new blog material. I'm sure Mr. Breeze won't mind if I "borrow" one of his ideas. Saturday was our monthly pawpawty to raise money for a wonderful animal charity. The theme for this pawty was Chickfest and it benefitted the Forever Home Feline Ranch in Springfield IL. Since I can't afford to give money, I donate my time instead. 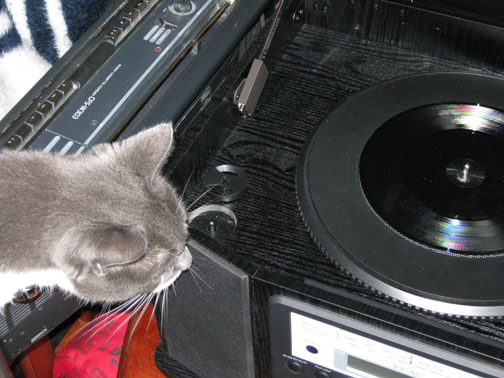 What better way to do that than spin tunes that make anipals dance. Music is in our family's blood and I'm now following in the peeps' giant footsteps. For those who don't know, my Pop was a DJ on a listener-sponsored NYC radio station in the late '70s-early '80s. Ma was a writer for the alternative music press in the '80s and early 90s. Altho Ma helps me pick my songs and post them, we run everything by Pop for his blessings. I learned from Pop's fundraising days to mention the url to donate after every song I play. 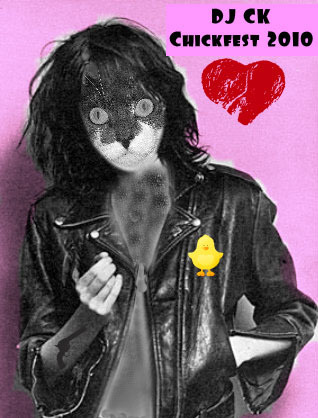 I only found out the Chickfest theme 2 days before the pawty which isn't much time to prepare. My criteria for a playlist is threefold: it has to tie into the theme of the pawty, it has to make my furrends move their paws and dance, and most importantly, it has to be fun to listen to at home. I won't play anything that I wouldn't play otherwise. "I'll Tumble 4 Ya by Culture Club 4 the cross-dressers here"
*takes off pleather jacket and thinks about taking off fur* All this dancing is making me hot"
Great post Cathy - as usual. You are not only a "stunning cat" but a "stunning" writer as well. I'm so happy you posted your playbill. That way I can play all of the songs at leasure. Alos, thanks for the special song you played for me. he he - M and i were both laughing at dat one. Thanks for all the great music. Pawpawties wouldn't be nearly as fun without our fantastic DJs. wow, didn't realize there was so much involved in being a dj. very nice of you to go to all that work for us anipals and the charities. Pawsome my furriend! Its great dat you has your mom and pop to helps wif da DJing and dat it helps to raises green papers.